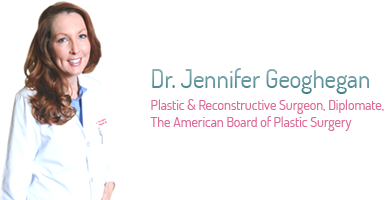 Jennifer Geoghegan, M.D., cares about your skin. A skilled plastic surgeon who performs a wide range of surgeries from cosmetic procedures of the breast, body and face as well as breast reconstruction, she is also an advocate of good basic skin care practices. Dr. Geoghegan says healthy skin starts with always wearing sun block and using quality skin care products. Dr. Geoghegan is as sensitive to her patient’s wallets as she is to their appearance needs. Not everyone wants or requires facial plastic surgery, so Oasis offers more affordable, minimally invasive rejuvenating procedures and pharmaceutical-grade skin care products for every budget. Oasis Plastic Surgery offers minimally invasive rejuvenating treatments such as Botox®, JUVÉDERM®, Radiesse® and laser treatments. Oasis Skin Spa is our medical spa located within Oasis Plastic Surgery, where we offer minimally invasive med spa treatments including laser treatments, microdermabrasion, dermaplaning, chemical peels and facials. Oasis offers these treatment in a relaxing, spa-like environment where a licensed medical aesthetician uses pharmaceutical-grade products with benefits that go beyond what is achievable at any day spa. Dr. Geoghegan offers complimentary plastic surgery consultations and our licensed medical aesthetician also offers complimentary skin evaluations.